Since 2006 with arts and activism, SINS INVALID outline ways of a revolutionary beauty. 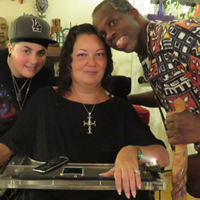 The organization born out of the meeting of Leroy Moore and Patty Berne is the vanguard of disability justice.This radical and emancipatory framework carried by disabled POC, queers, gender non conforming peoples fights against ableism and all systems of oppression intertwined : racism, capitalism, sexism, heteronormativity, etc. The wonderful Patty Berne, in the presence of the awesome Leroy Moore and Kiyaan Abadani, tells us more about SINS INVALID, her story as an activist, about eugenics and the ongoing struggle against ableism. The interview took place in the Bay Area of San Francisco in September 2014. Our warmest thanks to Patty Berne, Leroy Moore, Kiyaan Abadani and all members of Sins Invalid ! This program goes with a big shout out to Zig !